A lot of readers often ask me to blog about my experience of working as a Technical Writer in Canada. I’ve lived and worked almost half of my life in the mesmerizing, beautiful, and energetic land of India. 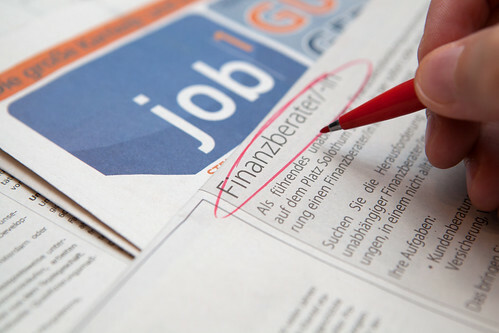 India is a land full of opportunities, especially for a technical writer. I was fortunate enough to work with very talented colleagues and supportive bosses and have learned a lot from the Indian Technical Writing industry through STC sessions and TWIN mailing list. However, one fine day I decided to leave everything to pursue my dream of getting formal education in technical communication. I was fortunate to get a paid co-op (internship) which got extended even during my last semester. Not only that, I was fortunate enough to receive two great job offers and I started working even before my course was finished. I conducted a skills development workshop for STC India (New Delhi) chapter two years ago. The workshop was warmly appreciated by the participants. The slide along with text transcript is available in this post. Though the presentation shared in this post is two years old, the basic principles of presentation has not changed much in the past hundred years. How to write a Technical Autobiography? When I joined Seneca College (Post Grad) Certificate in Technical Communication, the first (informal) writing assignment we received was to write a technical autobiography (worth 10%) in the TCN700 (Technical Writing I) class. Wait, I hear you saying that the term ‘technical’ and ‘autobiography’ don’t go well together. You are in good company as most of us in the class at that moment thought on similar lines. It was only when our dear professor explained the concept of technical autobiography when we understood how important it is for a writing student. 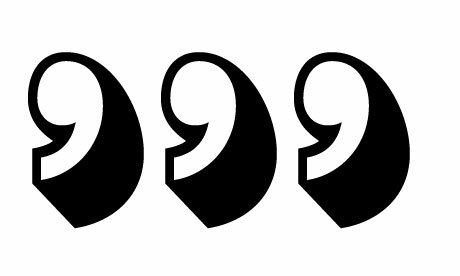 One of the easiest way to achieve conciseness in your writing is by removing wordy phrases. Wordy Phrases are long sentences that can be replaced by a single word (or few words) without changing the meaning of a sentence. How to add a Captivate Video in RoboHelp? A picture says a thousand words. What about a video? How many words can you save by adding a video to your documentation? This tutorial explains how to add a Captivate video in RoboHelp. Open Captivate. Create a video in Captivate and generate the output as Flash (SWF). Make sure that you have checked the option of “Export to HTML” since not selecting this option may generate an output that will not display properly in a web browser. 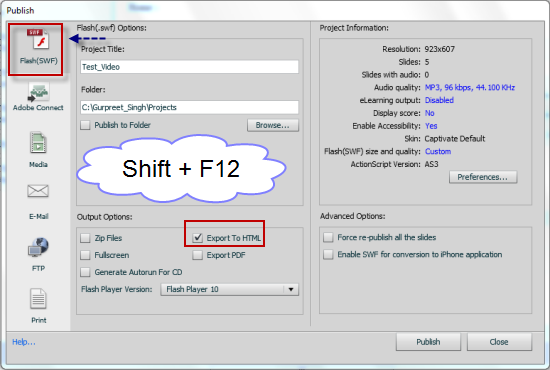 You can generate the flash output using File > Publish or by using the keyboard short-cut Shift + F12. Open RoboHelp and import the html page you just generated (as if you are importing a normal html page) in RoboHelp. You can do this by File > Import > HTML File. 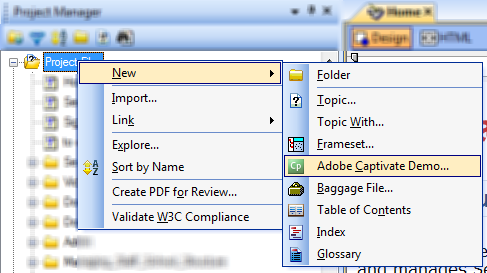 Alternatively, you can also add a Captivate video using RoboHelp toolbar. Click Captivate icon in the Objects toolbar. This displays a dialog box where you can directly select the swf file. Note: If you cannot see this toolbar then it may be hidden.You can display it by View > Toolbars > Object. Sometimes you want to generate quick demonstration videos within RoboHelp environment without opening Captivate. RoboHelp provides an option to add a captivate video without the need of leaving RoboHelp environment. Select View > Pods > Project Manager. The Project Manager pod appears. 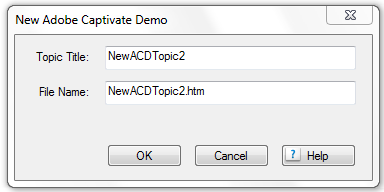 Right click on Project Files, select New > Adobe Capotivate Demo. A dialog box appears. You can add name of the video and the corresponding html page. Click OK. Create the Demo and close the Captivate window. Since you started the process within RoboHelp environment, there is no need to import the video. You can add this page in TOC, or create a link to this page from other pages in the project. When a user view the page the video automatically starts. Note: Sometimes, the automatic play becomes a bit annoying. If you want the video to start after a user clicks on it, select Edit > Preferences in Captivate, select Start and End preferences, deselect the option to Auto Play. This will publish a play button inside the video and a user will need to click on the video to start it. What do you think about this tutorial? Do you use a different approach to add captivate videos in RoboHelp? Leave a comment and let me know.